My roommate Bethieee (bless her heart, I don't know whether this is proof that she loves me or mocks me! ...maybe both) came up with a Plan C for me, just in case I don't make the deadline with my Plan B socks. 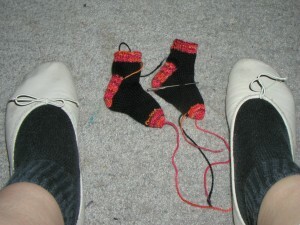 So I do (..ahem..) "officially" have a pair of handknit socks that *could* go out to my sockpal. Unfortunately, they'd only fit a teddy bear. It turns out I had to rip out the... Scared ya? .. fortunately not! And I did hear back from my recipient! She doesn't have 5 inch long feet after all!! on a re-measure, they came out to 9.5 inches long, which is good because that's about how long I made her sock, and she'd probably be frustrated if she had to fold 4.5 inches of sock toe under her feet every time she got dressed. 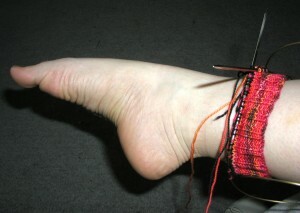 I love the ribbing along the sides of your pal's sock - I always wondered how stockinette socks don't get all floppy around the foot. Very nice! Can't wait to see the outside of this. And the little socks are adorable. Did you have a pattern for those or did you just make it up? Happy knitting. 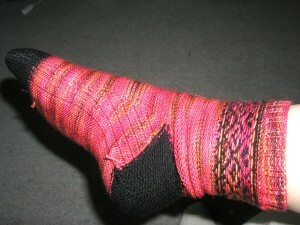 I really like the colors of the sock! I too can't wait to see the outside. I didn't use any particular pattern, they're pretty generic socks. Cast on 24, p2k1 rib until bored, change color, stockinette until heel, change color, work heel on 12 stitches and turn, change color, work gusset with decreases every other row until 24 stitches remain, stockinette until long enough, change color, work toe with decreases every other row until 8 stitches remain, thread yarn through stitches and pull tight, weave in ends. I am a fiber artist with far too many interests. Click on the pictures that are asterisked for extra information. Spectrum: Yellow-Orange Sock Yarn- IN!